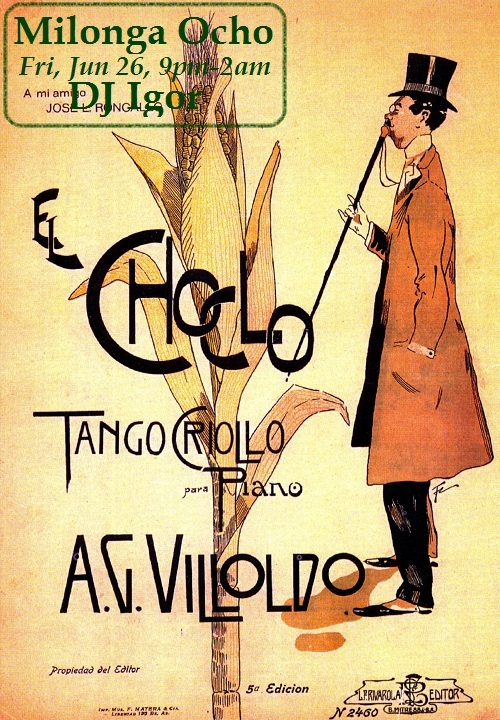 Angel Villoldo (1861-1919) was a man of many talents and many lives. He was typographer, a clown, a cuarteador (an assistant on horse races), a tram driver… a poet, a musician, a composer… Coming from the lower stratum of the society, everything he wrote, composed and performed was marked with a solid grain of sarcasm, and rather shameless wording. He was not “one of” but the pioneer, who, together with Gobbi Sr. and his wife Flora Rodiguez introduced tango to Paris in 1907. “But this is wonderful! The best you ever wrote! You must publish it!”, exclamed Roncallo. “Well then, why don’t you premier it with your orchestra?” asked Villoldo. “Are you out of your mind? With my classical orchestra?! Listen, old man, tango is a bad word in the high society…” quickly backed off Roncallo. “El Choclo!” was the answer. And so, on the November 3, 1903 the high society was applauding to the punchy rhythm of the ‘danza criolla’, not having a slightest suspicion that they are endorsing the first page of history that will soon develop into thousands of lawful descendants of “El Choclo”. Soon after that, Villoldo published the scores, having dedicated this tango to Jose Luis Roncallo. Why “El Choclo”? The capital letter alludes to a nickname, and nickname it was, of a pimp that was based in the surroundings of Junín and Lavalle, and called El Choclo because of unusual color of his hair. The original lyrics, by Villoldo himself, obviously was not published with the music, and there were several more short-lived attempts, by Villoldo and others. The stanza that is sung by Angel Vargas belongs to Juan Carlos Marambio Catán. But it was in 1947 when Enrique Santos Discépolo wrote its definitive stanzas: “Con este tango que es burlón y compadrito/ se ató dos alas la ambición de mi suburbio…” that Libertad Lamarque premiered in the Mexican movie “Gran casino”.